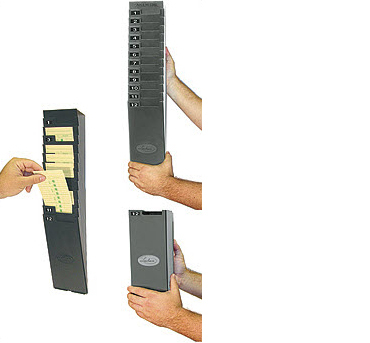 Expandable black time card rack. Holds up to 25 cards for this machine. Easily down-sized to 12 cards. Time Card Rack for most front loading time clocks. Call us if you are unsure if this will fit - we will know. making two smaller racks - 12 and 13 slots, or five: 5,5,5,5 and 5, etc.